Most of our economy is involved in production and sales, but there is a sector of the economy devoted to disposing of the things we no longer need or want, material that has lost its value and has become trash. Trash has a negative connotation in our society, and by association, people who work with trash, who collect trash, are somehow considered inferior. Why would those people go trundling through the neighborhoods on bikes or on foot, rummaging through trash cans, when the waste disposal company’s trucks come regularly to haul it all away? As a matter of fact, those trash cans are likely to contain not just genuine trash to be taken to the landfill, but materials that can be recycled. It is the recyclable material that is so very important to retrieve; and that is the work of the recyclers, the men and women who come through the neighborhoods performing an environmentally essential task. It can be hard work to spend hours every day pulling recyclable materials out of trash cans or dumpsters, then loading it onto carts or bicycles to take to a recycling center. They also pick up recyclable items that are too large to fit in the garbage cans and are left on the curb. This is a benefit for the residents who would otherwise have to pay for the waste company to come and pick them up. 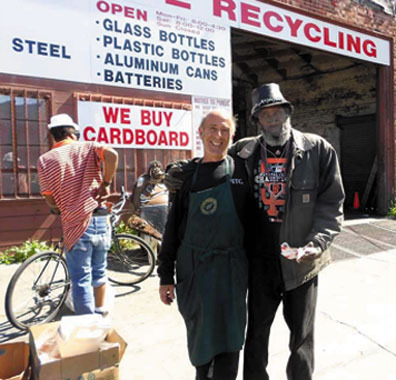 For years, recyclers have been hauling mountains of recyclable plastics, metals, glass and paper to Alliance Recycling at 34th and Peralta streets in Oakland. It is hard and messy work, but a look at the goals of Alliance Recycling will convince the reader of the importance and the value of what they’re doing. “Our neighborhood recyclers collectively salvage over 15,000 tons of materials each year that would otherwise go to landfills,” according to Alliance Recycling. An estimated 85 percent of recycling is collected by independent recyclers, while only 15 percent comes from curbside collections. After the neighborhood recyclers drag these massive amounts of waste products to Alliance Recycling, there is still a great deal more work to do. The recyclers now have to laboriously sort the materials, dump out the liquids or solid wastes, and then bag and place the cans, bottles, paper products and plastics in barrels or bins that are individually labeled. There are seven different kinds of plastics, aluminum cans, tin cans, different kinds of glass, paper and certain wood products. Everything must be put in the correct bin to be counted or weighed. The recyclers are paid the California Redemption Value (CRV) for certain plastic, metal and glass items, and are given locally set values for other materials. It’s not a lucrative way to make a living. It might take a garbage bag full of plastic bottles to pay for a loaf of bread and cheese. Many recyclers are homeless or living on the very edge. But they can control their own lives and decide when and where to work. And there is no boss. They know, whether they articulate it or not, that what they do is of value to society, and even more importantly, it is of value to the environment, the earth and the life it supports. And at Alliance Recycling, they in turn are regarded as valued clients and treated with respect. Michael Jones is 24 years old. He has been recycling since he was 12. He likes to recycle and it’s a way to earn money to meet his needs. But the satisfaction that he gets is more than that. Jones tries to explain the meaning of his work. Lena Hughes, an attractive and energetic young woman, started recycling just three years ago. It took some time to learn how to become a good recycler. She has had to learn to recognize what materials are recyclable, to sort and bag them and put them in the right bins when she gets to Alliance Recycling. She has had to learn the routes of the city garbage trucks so she can plan her days and routes for recycling. Now, like all the other recyclers in West Oakland, she has to face the imminent closure of the center. This will undoubtedly mean a longer way to travel and new procedures to learn. She expressed disappointment that there has been no outcry about the closure. “They should have some of the recyclers go and protest — like they did before,” she declares. Darrell Hopkins is known as Sleepy among the recyclers. He has been coming to the recycling center for more than 10 years “to survive,” he says. 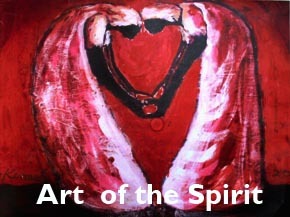 He sees no other way to survive but to recycle, and to help other people sort out their material. Hopkins is 55 now. He was recycling for a long time, until it became too strenuous for him. Now he receives some disability income, but he still comes every day to the recycling center to help out with something. “I always help somebody,” he says. Darlene Bailey also has been forced to cut down on her work load. She is a small woman, no longer young. 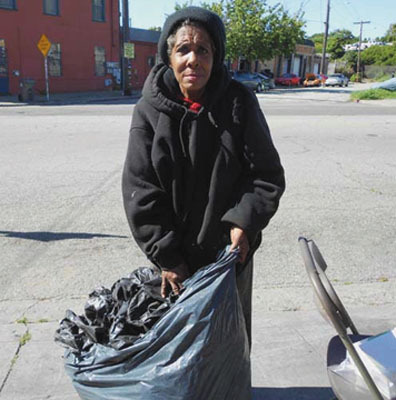 For about 10 years she was recycling five days a week, but now she can only manage to work two days. When Alliance closes, she will be forced to find a recycling center in a different location, even if it means traveling greater distances. “I’m going to have to,” she says, because she needs the money. Terry Kelly is in his forties and has been recycling for 10 years. He and his wife work together; she has been working as a recycler for even longer. They follow a regular schedule, going out three nights a week and turning in the material the next morning. 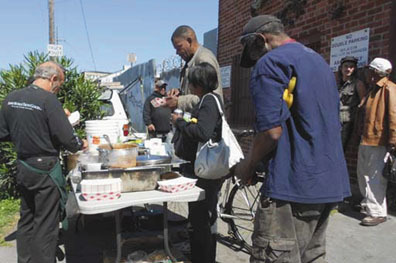 Joe Liesner is not one of the recyclers, but he connected with the recyclers in Oakland about six years ago, and has been serving a weekly meal in front of Alliance Recycling. Liesner is an activist and longtime member of East Bay Food Not Bombs, helping serve daily meals in Peoples Park in Berkeley and distributing surplus food to homeless and poor people in need in Berkeley, Oakland and Emeryville. It is clear when he talks about the meals he serves at the recycling center, that these people occupy a special place in his heart. He serves the food in take-out containers and will give them two servings if they have a partner or someone they share with. Joe has become friends with many of the recyclers over the years and they will check in with him before they leave. Alliance Recycling is closing in August. The recyclers will have to go somewhere else with their materials because the income is essential for them. It will be difficult to find another facility as conveniently located and with a management that has the policy of treating its clients with the generosity and respect that Alliance has shown over the many years of its operation. As for Joe Liesner, he is sure to stay connected and to find ways to share a meal with his recycling friends.